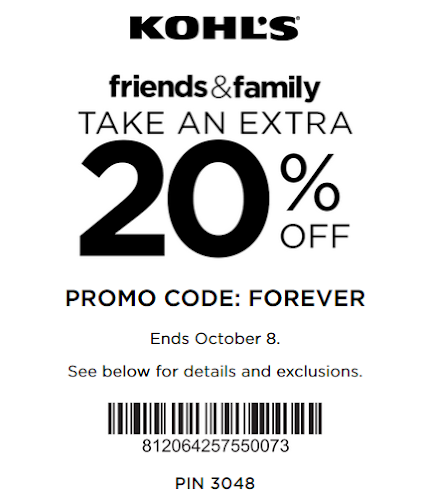 Kohl’s Mystery Savings Coupon: 40% 30% or 20% will be emailed to those on the Kohl’s email list the morning of 10/21/18. Valid for same day use only. You must be signed up in advance for Kohl’s emails in the first place, so if you are not already, do it now. Sign Up Now! Home Sale: $10 off when you spend $50 or more on your home purchase. Select styles. Excludes luggage. Ends October 21. Men’s Sale: $10 off when you spend $50 or more on your men’s and men’s big & tall purchase. Select styles. Ends October 21. Luggage Event: $50 off when you spend $200 or more on luggage. Select styles. Ends October 21.